York City extended their unbeaten run to 16 games with victory over Newport County and claimed their place in the League Two play-offs. Michael Coulson's second-half free-kick from 25 yards secured the win for Nigel Worthington's side. Newport went close to opening the scoring when Lee Minshull headed Ryan Jackson's throw against the post. Visiting keeper Ian McLoughlin denied Adam Reed twice and saw Coulson hit the crossbar before his late winner. "The run we're on at the moment is magnificent effort by the players and the staff. "We fully deserve to be in the play-offs, I think that's the first thing. We've not crept in the back door. "It doesn't matter what way you get in we've really forged ahead and stuck to our guns and we've got in there through determination and energy. "There are two big games to come home and away and at the moment as it stands we've got a one in four chance of getting through, so that's the nice side of it." "If they score a good goal then you can sometime hold your hand up and say you've been done by a bit of brilliance or skill. "But we know we should have stopped them scoring and come away with a draw. "We need to bring some fresh faces in and need to make sure that the recruitments we bring in are better." Match ends, York City 1, Newport County 0. Second Half ends, York City 1, Newport County 0. (York City) wins a free kick in the attacking half. Foul by Kevin Feely (Newport County). William Hayhurst (York City) wins a free kick on the left wing. Foul by Ryan Jackson (Newport County). Attempt missed. Chris Zebroski (Newport County) right footed shot from outside the box is close, but misses to the left. Foul by Calvin Andrew (York City). Kevin Feely (Newport County) wins a free kick on the left wing. Attempt missed. Michael Flynn (Newport County) right footed shot from outside the box is close, but misses to the left. Substitution, Newport County. Michael Flynn replaces Adam Chapman. Michael Coulson (York City) wins a free kick on the right wing. Foul by Shaun Jeffers (Newport County). Corner, York City. Conceded by Andrew Hughes. Attempt missed. William Hayhurst (York City) right footed shot from very close range is close, but misses to the right. Goal! York City 1, Newport County 0. Michael Coulson (York City) from a free kick with a right footed shot to the bottom right corner. Ryan Bowman (York City) wins a free kick in the defensive half. Corner, York City. Conceded by Lee Minshull. Foul by Chris Zebroski (Newport County). Substitution, York City. William Hayhurst replaces Lewis Montrose. Substitution, Newport County. Shaun Jeffers replaces Christian Jolley. Hand ball by Robbie Willmott (Newport County). Attempt blocked. Robbie Willmott (Newport County) right footed shot from outside the box is blocked. Substitution, York City. Ryan Bowman replaces Ryan Brobbel. Corner, Newport County. Conceded by Nick Pope. Attempt saved. Robbie Willmott (Newport County) right footed shot from outside the box is saved in the top left corner. 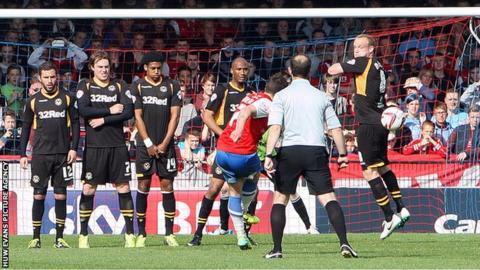 Chris Zebroski (Newport County) wins a free kick in the defensive half. Attempt missed. Christian Jolley (Newport County) left footed shot from outside the box misses to the left. Attempt saved. Max Porter (Newport County) right footed shot from the centre of the box is saved in the centre of the goal. Foul by Aaron O'Connor (Newport County). Adam Reed (York City) wins a free kick in the attacking half. Foul by Christian Jolley (Newport County). Attempt saved. Adam Reed (York City) right footed shot from the centre of the box is saved in the bottom right corner. Keith Lowe (York City) wins a free kick in the attacking half.